Santa Maria in Vallicella, also called Chiesa Nuova, is a church in Rome, Italy, which today faces onto the main thoroughfare of the Corso Vittorio Emanuele and the corner of Via della Chiesa Nuova. 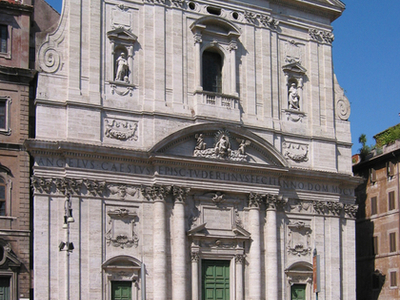 It is the principal church of the Oratorians, a religious congregation of secular priests, founded by St Philip Neri in 1561 at a time in the 16th century when the Counter Reformation saw the emergence of a number of new religious organisations such as the Society of Jesus (Jesuits), the Theatines and the Barnabites. The ground plan follows the Counter-Reformation design of churches established at the Gesù; a single main nave with transepts and side chapels, leading towards the High Altar. Neri had intended that the interior be plain with whitewashed walls but it was filled by patrons with various artistic works, mainly during the period from 1620 to 1690, including masterworks by some of the principal artists of those decades in Rome. It is renowned for its altarpieces by Barocci, Pietro da Cortona's ceilings, and the Rubens slate and copper altarpiece. Pietro da Cortona's decorations include the 'Trinity' in the dome (painted 1647-51). The prophets 'Isiah', 'Jeremiah', 'Daniel' and 'Ezechiel' in the four pendentives were painted in 1655-56 and 1659-60 along with his fresco of the 'Assumption of the Virgin' adorning the apse. There is an implied visual continuum between the dome and the apse fresoes aided by the fact that there is no dome drum; the assumpting Virgin (in the apse) raises her eyes towards Heaven and the Father (in the dome) extends his hand as if bestowing His blessings upon her. 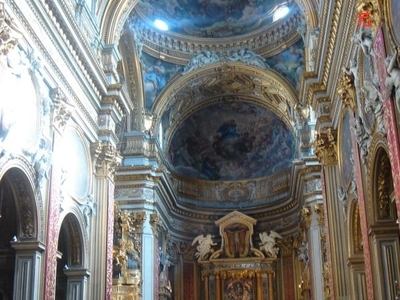 Here's the our members favorite photos of "Churches in Rome". Upload your photo of Santa Maria in Vallicella!